On day two of their visit to Northern Ireland, The Duke and Duchess of Cambridge spent the day in Ballymena, meeting with organisations that are working to create a bright future for the next generation. Kate stepped out in an all-blue ensemble today. She debuted the Mulberry 'Ashleigh' virgin wool coat (£1,735) from the brand's Fall 2018 collection. The design is a reinterpretation of the iconic trench, featuring a removable shoulder cape, oversized collar and a belt to cinch the waist. The Duchess also wore a new bespoke dress by Jenny Packham. It is a simple sheath dress accented by navy blue velvet trim at the neckline, cuffs, and waist. Today we saw the return of the Jimmy Choo 'Celeste S' Navy Suede Clutch and Rupert Sanderson Malory Navy Suede Pumps. Kate finished off the the look with her beloved Sapphire & Diamond Oval Drop Earrings. 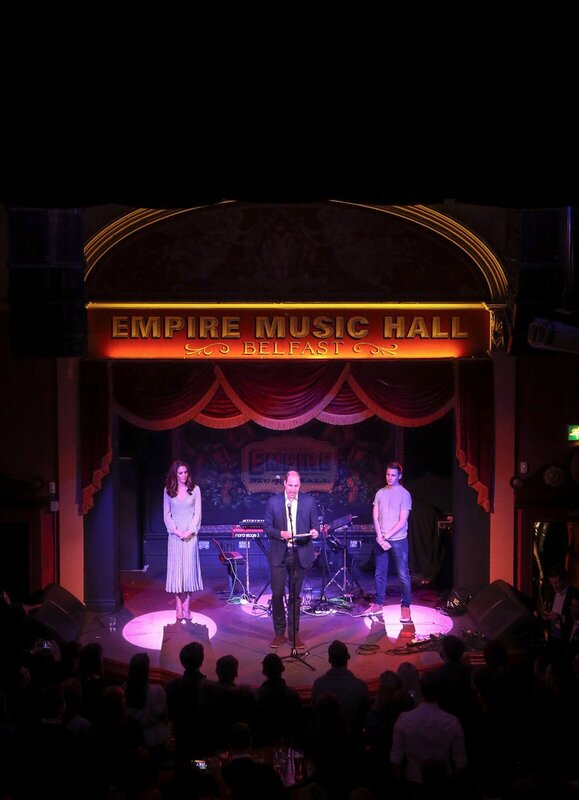 The Duke and Duchess of Cambridge ended the first day of their official visit to Northern Ireland at the iconic Empire Music Hall in Belfast. 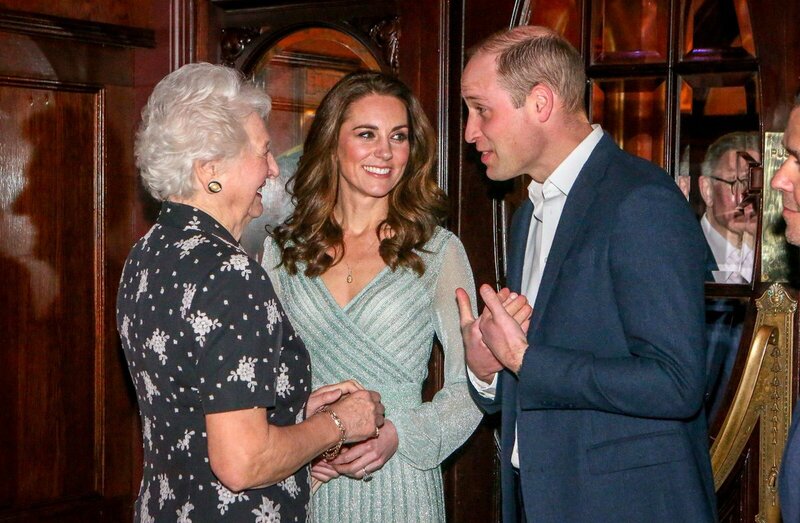 Kate and William attended an informal reception celebrating young people who are making a real difference in Northern Ireland. 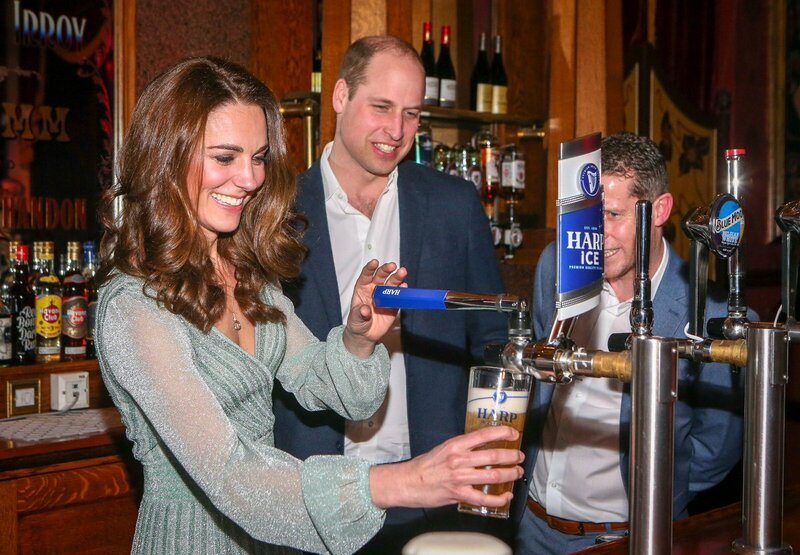 The royal couple got the party started by each pulling a pint of Harp! Guests encompassed representatives from Northern Ireland’s business, arts and sport sectors, including Dame Mary Peters who was today appointed Lady Companion of the Most Noble of the Garter by Her Majesty The Queen. The Duchess looked magnificent in a new mint metallic lurex midi dress by Missoni (£1,590). The whisper-weight cocktail dress is woven with shimmering threads and has an elegant V-shaped neckline with a pleated midi skirt. Other new pieces included a demi-parure from Kiki McDonough's 'Candy' collection. Kate wore the Kiki 'Candy' mini green amethyst and diamond earrings (£1,750), and the Kiki 'Candy' mini green amethyst and diamond pendant necklace set in yellow gold (£1,250). The Duchess offset the dazzling ensemble with her Gianvito Rossi 'Gianvito 105' Praline Suede Pumps, and Mulberry 'Baywater' clutch. Unfortunately I will not be able to cover the remaining events of the royal visit to Northern Ireland as I will be away. I will do catch up posts when I return on Tuesday. The Duke and Duchess of Cambridge made a surprise trip to Northern Ireland today where they will make a number of stops over two days with a focus on celebrating the young people of Northern Ireland. The visit was kept under wraps for security reasons. For arrival at Windsor Park Football Stadium in Belfast, home of the Irish Football Association (IFA), Kate wore her red Carolina Herrera coat, first worn in Canada 2016 and then again in Paris 2017. She teamed it with black jeggings and the LK Bennett 'Marissa' Black Suede Booties which Kate debuted earlier this month. 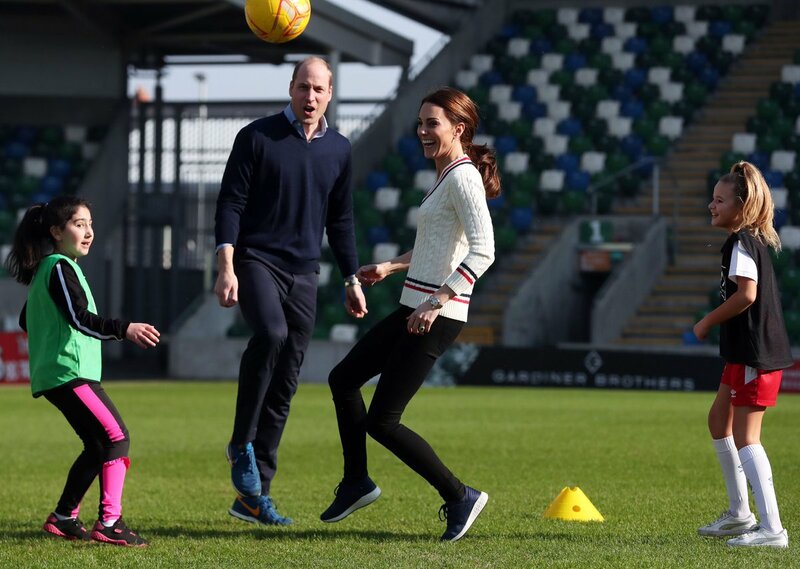 The Duchess made a quick wardrobe change when she headed out on to the football field to learn more about the IFA run outreach programmes; ‘Shooting Stars’ which encourages young girls to play football, and ‘Ahead of the Game’ which works to support clubs and volunteers when dealing with mental health issues, with a focus on challenging the stigma and preventative measures. Kate sported a navy Barbour 'Longshore' Quilted Jacket (£159). She also debuted the LAUREN Ralph Lauren Cable-Knit Cricket Sweater (US$125). The design is modeled on the original Ralph Lauren Cricket Sweater created in 1972. Another new item were the New Balance Fresh Foam Cruz Sneakers (US$89.95). Kate finished off the look with her KIKI Lauren Yellow Gold Diamond Pave Leaf Earrings and Cartier Ballon Bleu Watch. The Duke and Duchess then visited Fermanagh to see the work that the charity Extern is doing at their Roscor Youth Village, which is a residential activity centre for children referred to the charity by social workers or the Department of Justice. The site provides a safe space to help and support these young people, with particular emphasis on outdoor activities and developing independent living skills. William and Kate will end the day back in Belfast at the iconic Empire Music Hall to attend a party celebrating young people who are making a real difference in Northern Ireland. The Duchess of Cambridge, patron of 100 Women in Finance Philanthropic Initiatives, attended a gala dinner at the V&A Museum London on Wednesday night in aid of Heads Together legacy programme ‘Mentally Healthy Schools’. Kate looked every inch the princess in a glamorous gown by Italian fashion house, Gucci. The bespoke floor-length dress featured delicate layers of pleated tulle in a soft array of pinks. She complemented the romantic hues with a burgundy velvet waistband. An apt choice on the eve of Valentine's Day! The dazzling earrings are the Kiki McDonough morganite drop earrings which she first wore to Pippa's wedding in 2017. Kate appears to have accessorized with the burgundy velvet clutch she carried at Princess Eugenie's wedding. It is the Prada 'Rosa' minaudiere (US$600) shown below in a satin finish. The shoes appear to be her Oscar de la Renta Platinum Lamé Cabrina Pumps. The Duchess had her hair styled in a half up-do. This is the fourth occasion the Duchess has attended the 100 Women in Hedge Funds (now Finance) gala. For her first attendance in 2011 she donned a red Beulah number. In 2013 she wore the Jenny Packham Ink Blue Silk Tulle Gown. For the 2015 100 Women in Hedge Funds gala, Kate stepped out in a bold floral gown by Erdem. The Duchess of Cambridge attended the Royal Foundation’s ‘Mental Health in Education’ conference at Mercers’ Hall in London. Kate wore a new bouclé jacket and skirt set. The Daily Mail has revealed it is a custom design by Dolce & Gabbanna. She coordinated the boucle separates with her favorite combination of her Mulberry 'Bayswater' black suede clutch and Tod's Black Suede Block Heel Pumps. Kate wore her Kiki White Topaz Cushion Drop & Diamond Earrings.